For the past three years Amazon has sold a particular type of Kindle format called Kindle Print Replica. This is basically a PDF file wrapped in a Kindle ebook file, and it offers many of the benefits of PDFs (fixed layout, graphics, charts, discrete page numbers). Today Amazon launched a new tool to let authors and educators make these PDF-ish ebooks. it's called Kindle Textbook Creator, and it's not to be confused with Amazon's other ebook creation apps (for comic books and kids books). Besides the fact that the other apps make a different flavor of Kindle ebooks, the output of the Kindle Textbook Creator cannot be read on a Kindle - just on the Kindle apps for Windows, OSX, Android, iOS, etc (or so says the FAQ). That's going to limit the usefulness of any textbook made with this app, but I don't think that will matter much. If you really want to get a PDF on an E-ink Kindle, you can of course side load it and read the PDF directly. And with the digital textbook market effectively stillborn, there's really not much of a market to miss out on. And professors everywhere just realized they can write their own course and/or supplementary texts and sell them via Amazon (and require them for their courses, of course). And keep 70% of the sales price. The “supplementary course material” required purchase jig has been going on for years, ofc, but for until now it was limited to spiral bound books purchased from the local Kinko’s. I don’t think the professor made as much money on the old fashioned paper ones as he/she will on Kindle versions. Now that is a market which could readily be switched over to the Kindle from whatever print shop is currently supporting it. What's more, those course materials could fit nicely under the $9.99 cap for the 70% royalty. In fact, I would suggest that this app is less about making textbooks for the Kindle than it is for making a Kindle version of all the other educational materials that a teacher might use in a class and pass out to her students. There may not be much money in digital textbooks but there is value in getting teachers and students to use the Kindle apps; this keeps them in reach of the Kindle Store where Amazon can sell them other ebooks. Have you used the app yet? You can embed video or audio in a PDF (including a link to an external file), but will that still work after the PDF has been converted? You can also put live computer code inside a PDF; will that still work in a Kindle app? The release notes say that audio and video will be supported in the future, but there is currently no way to see which features work without actually publishing the book, since you cannot read the output file directly and KDP does not provide a book preview download link for these files like they usual do. The online preview is not interactive. I couldn’t find a way to download or extract the ebook files either (I saw your post). That’s strange, isn’t it? I find this interesting. PDF has been around for quite awhile, and Amazon even sold them prior to the invention of the ‘ebook’. They have been offering textbooks in Print Replica format for, what, a couple of years now, but now that is available in KDP, it will be very interesting to see what people do with this. Meanwhile in the world of ePub, there is FXL. I’ve never understood why the industry (or at least people involved with ePub spec) went to all the trouble to invent FXL when PDF does all of that and more. Great: so it leverages HTML/CSS for all those web designers out there. But as it turns out, nobody can hand code FXL, any more than they can hand code PDF. The only available tool is InDesign, which is not the easiest tool to master for would be self publishers. 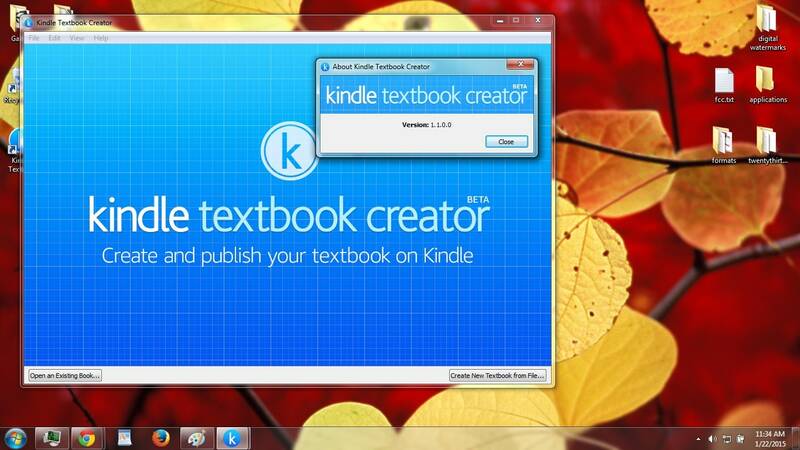 But anyone can create PDFs, and now they can publish and sell them, thanks to KDP. So as with their comic book format, which basically bundles a stack of image files (that tool will convert PDF files to image files also) they are making it dead simple to publish something a little more sophisticated, potentially more versatile. Arguably, it’s much easier to create a PDF file than a reflowable mobi or ePub. So, but for the fact that Kindles do not support Print Replica, I can see this being used for things other than textbooks. Together, this appears to be Amazon’s response to FXL ePub and Apple’s proprietary ibooks format. Are we seeing FXL in the wild? At all? You are aware that it is not necessary to ‘side-load’ PDFs? You can use Send To Kindle for this, and they become part of your Kindle library. Great for all those camera user guides and such. It would be nice if Send To Kindle will support Print Replica as well, as that confers a few extra reading features that PDF does not offer (Notebooks, flashcards, highlighting, dictionary lookup—ironically, Kindles support highlighting and dictionary lookup and TTS (kindle touch and keyboard) for PDF, but Fire does not). Will they add accessibility support (tts, voiceover, talkback). “Nobody can hand code FXL”? Hmm. I’ve had two thorough tutorials on my blog for several years on how to do exactly that, and published a complete guidebook well over a year ago, which has sold extremely well. And Kindle FXL is more than just a bundle of images, since you can add things like text and image popups with panel view, etc. That was Amazon’s answer to FXL ePub. This is Amazon attempting to force exclusivity on educators and other content creators. You can sell your KF8 fixed layout files outside Amazon, but not these. What is puzzling to me is why Amazon, with all their resources, has only bothered to produce three mediocre content creation tools rather than focusing on one that does a really good job. There is no reason to have fragmented tools, since they all essentially produce the same thing, a fixed layout file from a PDF or epub input. The booktype value is the only variable, and that could be done with a drop-down options menu. All this clearly goes to show that Amazon is not a software company like Apple, who made a highly complex and useful tool with iBooks Author, and got it right the first time. Amazon’s new “tool” is useless as far as I can tell. I’ve never understood why the industry (or at least people involved with ePub spec) went to all the trouble to invent FXL when PDF does all of that and more.